Conjure images of Canada’s remarkable North and one envisions the spectacular Northern Lights, awe inspiring vistas, immense areas of unspoiled wilderness. Clear skies with brilliant shades of blues, unclouded by the pollution of the cities, fresh streams flowing with clear pure waters, amazing tundra and the largest Boreal Forest in North America. The air is crisp and fresh. Sunsets are spectacular as are the sunrises, skies lit with brilliant pinks and fiery reds. Sundogs, shining their glory on the colder days, reflections of the sun on the ice crystal contained in the atmosphere. Sometimes as many as 4 of these beautiful anomalies may be seen linked together by a rainbow. Rivers, great lakes, wildlife, the Canadian North has it all. Desiring to fulfill my dream to escape inner city life, the stresses of traffic jams, excessive noise, pollution and indifference, I chose to begin anew and leapt wholeheartedly into the unknown. In 2005 I chose to follow my dream to live and work in such an environment, close to nature, to the land, to get back to basics, to what is truly important. I was amazed at the vast open untouched wilderness, the herds of free roaming Bison, landscapes that can only be called amazing. The diversity of First Nations and Inuit cultures, their traditions and lifestyles I had long studied and admired. Their glorious arts and crafts passed down through generations are all truly a Canadian Treasure. The people are kind, gentle and welcoming. I was made to feel immediately at ease, accepted and that I had finally come home. Tourists arriving from distant lands, will venture to visit the majestic Nahanni Valley, the vast Mackenzie Valley, and will see wondrous water falls and landmarks. They may charter a vessel to fish the great clear waters, or charter a helicopter that will transport them into a totally different world of breathtaking beauty. Along the way they will meet many new challenges, they will also meet Elders who hold the traditional Wisdom and if they are lucky they will learn. They will come away from their experience far richer than when they first arrived. But alongside the beauty, the Canadian North also holds a secret. One will not be taken by any tour guide or outfitter to be shown the harsh cruelty that takes place across this vast and beautiful landscape. As a tourist you will not be taken to see the rotting carcasses of dogs that have been routinely rounded up, shot and dumped. You will not be taken to the remote roads, and be shown the dogs that have been tied to trees, their muzzles taped and which have been gunshot. Guides will not take you to the yards, or kennels where sled dogs are chained, often without shelter in sub-zero temperatures. You will not be shown the bodies of those frozen to the ground, nor the surviving dogs that continue to suffer severe starvation, hypothermia and dehydration. No, as a tourist you will be shown only the beauty of the land. Unfortunately in this remote and beautiful region, there are no shelters where an unwanted animal may be surrendered and placed in a new and caring forever home. Hardworking volunteers take in and care for these animals in their own homes, in the hope of being able to successfully place them. Some southern shelters co-operate in this, taking in Northern dogs for adoption. There are no veterinarian clinics to treat sick or injured animals, provide spay and neuter to control population nor are there licensed euthanasia services. A bullet must do the job. The N.W.T. and Nunavut do not have An Animal Protection Act in place, and with antiquated federal laws leading to a less than 1% successful prosecution rate cruelty mostly goes unnoticed and unpunished in these remote regions. The R.C.M.P. may not file charges under the Animal Cruelty Legislation as contained in the Federal Criminal Code of Canada. Municipal By-Law officers in the various and wide spread communities of the North do not have the authority to seize animals in distress, what they do have is the authority to round up and shoot dogs running at large. A heartbreaking task at best. We must speak up for the dogs, for all animals in the far Canadian North who do not have the benefit of appropriate legislation in place to protect them and exact punishment against perpetrators of cruelty. Dogs and pups will continue to freeze to death in sub-zero temperatures tethered to chains. Cats and dogs of all ages will continue to be dumped in an unforgiving wilderness left to suffer an agonizing death, or be tormented and abused in their own backyards and on the streets. Northern Sled dogs are historical in the Canadian North. For centuries these hearty, strong and amazing dogs have been and continue to open up the Canadian North to the peoples of the North, necessary as an early means of transportation over vast expanses of snow and ice. Hunters, trappers, explorers, outfitters all utilize these amazing dogs thereby ensuring their own livelihood. Allowing them to feed and clothe their families, as well as generating revenue from the Tourist Industry and fur trade. A recent study comparing these dogs to those of other athletes, race horses and human athletes deemed that sled dogs are on the TOP. Renowned for their stamina, their strength and their ability to exist in conditions that would see most dogs we classify as pets die quickly in the hostile environment. 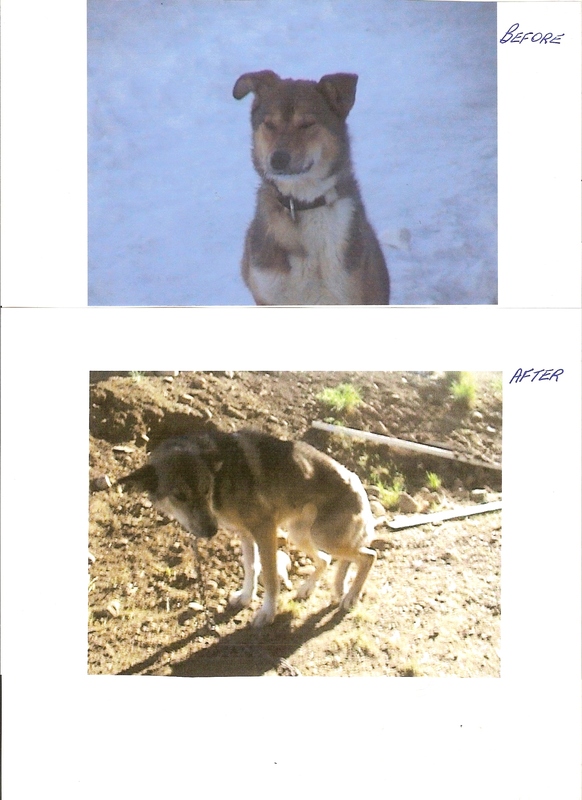 The case of the three surviving sled dogs discovered in December 2008, in the remote community of Tuktoyuktuk, Inuvik is an example of immense cruelty and what would appear to be indifference on the part of the Legal Authority of the R.C.M.P. These dogs were discovered after a resident in Tuk notified Municipal By-Law of a pack of dogs, one of which entered her yard and as she watched horrified, devoured her puppy. These dogs had broken free of their chains. Starved and neglected they were on the hunt. The By-Law Officer responded, some dogs were shot; some were tracked back to the yard where they had been held. It was in this yard that the bodies of three sled dogs were found frozen to the ground. Also found were three surviving dogs in terrible condition as pictured above. 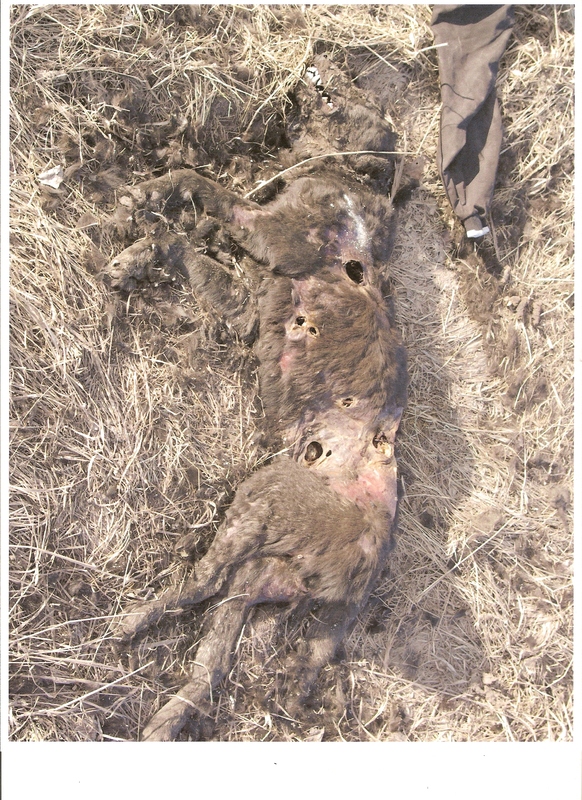 The white dog’s back is severely matted and covered in an unknown substance, possibly oil or feces, bare skin is exposed to the elements and the animal can no longer retain body heat properly. Both animals are extremely dehydrated, sick and skeletal. The third dog, not pictured here, can barely stand. Despite the fact that an R.C.M.P. Officer was called in to investigate this case, and the involvement by both the Municipal By-Law Officer and the Executive Director for the Beaufort Delta Regional SPCA, charges were not laid. Even with the publicity through press from CBC Radio Interviews, the News/North articles and PETA, the case has yet to be reopened. At the time that this article is being written, the three surviving dogs continue to be in crisis, without shelter, water and food. Despite the filing of a Cruelty Report to the Crown by the SPCA, and the fact that witnesses willing to testify have been found, and that the owner/caretaker of these animals had been previously reported for his failure to provide for these animals, the dogs have not been seized nor have charges been laid. While it would be wonderful if Parliament had passed the revised Legislation as presented in 2008 (both Liberal and Conservative parties vetoed the new bill) what good would it do for the animals who continue to suffer indescribable horrors in the Canadian North? Apparently even the very poor legislation that does exist federally under the Criminal Code of Canada does not apply to the Northwest Territories or Nunavut. The Federal Minister of Justice will tell you that it is up to each province and territory to come up with their own Animal Protection Legislation, to a point that is true. However, in areas where there is no such Legislation, it is up to the RCMP which falls under Federal jurisdiction to enforce all aspects of the Criminal Code of Canada which includes the Animal Cruelty Legislation. So who is accountable here? The Minister of Municipal and Community Affairs, NWT, Mr. Robert McLeod, has cited that the NWT has a contractual agreement with the RCMP to provide policing, to ensure the safety of the communities and citizens of the North; however the Government of the NWT cannot dictate to the RCMP how to do their jobs. Who ultimately is responsible for condoning and allowing the decades of cruelty to continue? In July 2008, I prepared and had couriered a 3” binder to the GNWT Federal Representative, Denis Bevington, NDP Artic West. Contained in that binder were over 1,000 signatures, hard copy signatures from petitions circulated in this town, signatures obtained on two online petitions that received international attention. This binder contained sample Animal Protection Acts from various provinces and a copy of the Federal Criminal Code, Animal Cruelty Legislation as an easy reference for the powers to be. Graphic pictures, horrific in nature, detailed accounts of animal cruelty sent to me from people involved in rescue work in the North. Additional signatures were received as recently as January 20th in the offices of NWT Ministers: Mr. McLeod, Minister MACA, and Jackson Lafferty Minister of Justice. The current legislation commonly referred to as the “Dog Act” in the NWT, pertains specifically to dogs and no other animal. MACA’s office representative who was recently interviewed by CBC North as was I, stated that the current act does need to be reviewed and revised, that this will be under consideration. When is this going to happen? The GNWT has published the current matters coming before the Legislature and Animal Protection Legislation is not one of them. The wheels of government turn slowly, not just in the NWT but across the nation. One must be patient, yet it is difficult, as time runs out for so many victimized animals. An appeal has been presented requesting that a very real Animal Protection Act be passed in the NWT, an appeal has been requested that until this Legislation is enacted, that the governing body representative for law enforcement in the Canadian North, uphold the Animal Cruelty Legislation as contained in the Federal Criminal Code of Canada. Positive affirmative action must be taken as quickly as is possible, otherwise as they have in past decades, these animals will continue to be defenseless against the cruelty, apathy and indifference. Thank you Zephr for posting such an informative piece. You are helping to bring the north and its issues into the consciousness of those who had never thought twice about it. Thank you for your undying support Kestrel. The North has been a place of imagination and wonder for many for a very long time. It is a very real place, with very real issues that need to be addressed. In particular the treatment of animals, animals that provide a very real service, yet continue to suffer at the hands of irresponsible individuals. Education on the care and welfare of these magnificent and powerful dogs is a must, education of the consequences resulting from failure to provide for the health and welfare of these animals is also a must, in order to put an end to the continuing suffering.